The Family Car would not have been nearly as successful if the setting of The Wonder Years didn’t line up with The Greatest Generation fading out and the dawn of Generation X. But because it does, the Arnolds’ old wagon becomes a symbol for the traditional family values and even Jack himself. The show has established pretty well by this point that Jack takes a lot of pride in keeping the old wagon alive, and it’s pretty poignant (and sad) to see him slowly come to grips with the fact that there’s less of a role for the work habits and traditional values he was raised with. But the episode actually elevates the car beyond a mere allegorical symbol. Jack has poured his money and his time into keeping it running smoothly. There’s been hiccups, particularly as it comes of age, but Jack’s always kept it rumbling on. In other words, it’s a lot like the Arnold family itself; the episode really made me feel his hurt when people, even his own wife and kids, couldn’t understand why he didn’t want to sell it short. I found myself really affected by Dan Lauria’s performance this episode as maybe my favorite performance in a single episode yet this series. He alternately looks strong and lost in a world that’s move past the one he lives in. No actor on this show says more with facial expressions and subtle body language than Lauria. Meanwhile, we have Patrick Cronin playing Marvin Lutz, the polar opposite of Jack, who embodies everything slimy and seductive about consumerism and image. His 1969 Mustang (one of the greatest cars of all time, by the way) immediately wins over the family and even earns the eye of Jack, at least until he learns that he’d have to sell out his old wagon for dirt. On the school front, Kevin gets bombarded by taunts from the wonderfully despicable Craig Hobson (whom I described as “that little yit” in a previous recap before we learned his name), who provides a great foil for Kevin, Paul, and Winnie. Hobson strikes out with a girl and is, in general, a little spoiled brat, but he always seems to trump what Kevin has to say with a taunt about Kevin riding around in an old bucket of bolts. It’s hard to envision middle school culture caring so much about what cars people ride in, but it fits with the symbolism the car takes on in the episode. The Family Car’s most excellent scene is the conversation between Jack and Norma about moving on and accepting that the car is dying, the times are changing. Lauria and Alley Mills are routinely fantastic, but are as good as they’ve ever been here. Very, very good episode. The Family Car is a reminder of how great Dan Lauria is for this show and how much depth and emotion this show can wring out images and conflicts as simple as a dying car and the decision to buy a new one. This week’s edition of Wow, Awesome Editing: the montage of Jack negotiating with potential buyers of the old car, cutting back and forth between Jack and a new buyer each time. Great shot by Kevin, nailing that glob of potatoes on Hobson’s shirt. It’s taken awhile, but Danica McKellar and Fred Savage are finally starting to develop some serious chemistry. I’m looking forward to the next episode that takes on the Kevin-Winnie relationship. This was a spectacular episode for music. We have the awesome use of “I Can See Clearly Now” and that perfect, closing use of Neil Young’s “Long May You Run” (quoted at the start of this recap). Thanks Dean, I agree, this is one of my favorite episodes! What hindered this episode for me is the lack of anybody actually riding in the car? Jack says “we should go for a drive, when was the last time we did that together?” Wayne occasionally drives the car, Kevin was with him once or twice, Norma claimed to be out for groceries but we didn’t see her, etc… It felt like a forced bond for Jack to be so attached to a car that we don’t see him driving. Gidday – I agree with all your comments & I just love this show. It’s a beautiful snap shot of the times as they were & as I remember them & my childhood. They are re-running the series here in Australia at the present (2013) but only one episode a week & they just showed ‘The Family Car’. At the time, we here in Australia were never lucky enough to hear or know about all the various music that was being played in the episodes. It might’ve been big over there but there are a number of songs that we never heard here. I have one BIG question & I know there are many others who’d also like to know the answer … What was the name of that GREAT song that was playing right at the very end when their old car was being towed away & who sang it (because it wasn’t Neil Young)? If someone could answer this, I know I & many others here would be extremely grateful. Rusty – Believe it or not, it’s Neil Young in a song he recorded with Stephen Stills: “Long May You Run” off an album with the same name. Many songs in TWY use cover versions for copyright reasons, but my version of this episode on NetFlix sounds exactly like the original. This is a very memorable episode. However for you car guys out there, this may be one of the most frustrating sit-come episodes in history. The problem is with the station wagon itself. It is constantly referred to as old and broken down. One of Kevin’s freinds asks when Kevin’s dad is oing to get a car from this century. At another point I believe it is referred to as nine years old. Then there is the For Sale sign in which Jack wrote that it is a 1963. That brings it up to six years. The problem is the ca is a 1968 Dodge Polara Wagon. Since it is established that the period is the fall of 1969, that makes the car a little over one year old. In fact, the Arnolds had the car no longer than about 15 months since they still had the 1963 Impala (seen in the opening credits) at the end of the first season. I’m sure this wasn’t missed at the time. After all, this clearly knowledge car-person in or contracted with the production team who was responsible for getting all those period cars on the streets every episode. 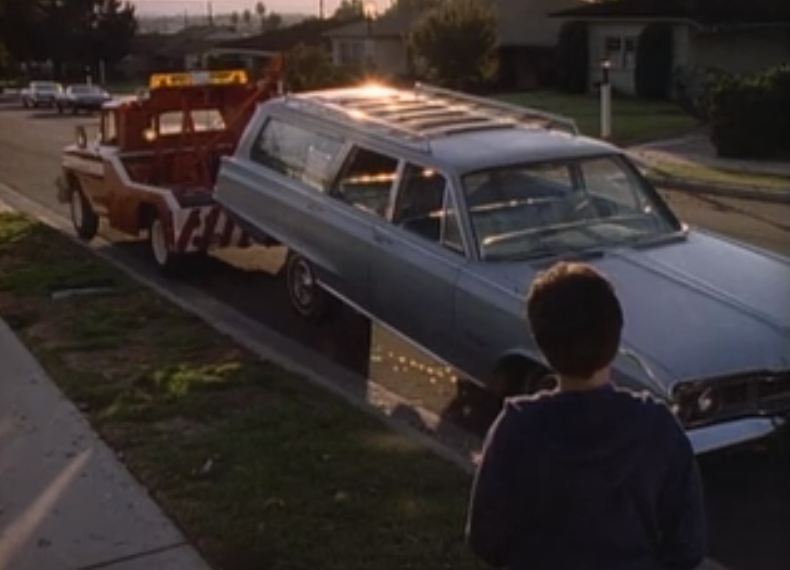 I realize they had this great script and someone pointed out that it accurately didn’t work for with the established family car and they just said “Screw it, were not going to stop us from doing this great script.” After all, to most viewers it just looked like an 20-something year old wagon. One last distraction for the car guy was the new car, which was a 1969 Ford Galaxy 500. At this point, the 1970 models would have been out but I guess it is not exactly out of character for Jack to buy a left-over model.